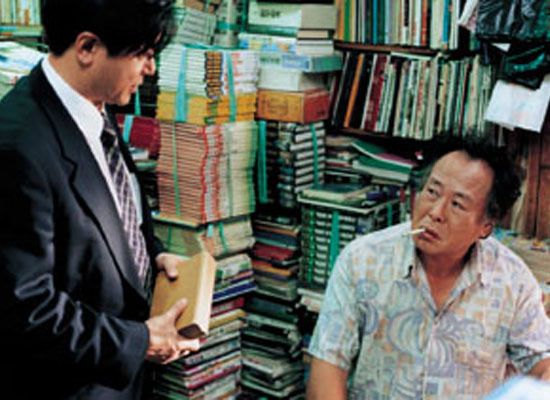 Min-Ki (Choi Min-Sik) is an unemployed banker. He now takes over the domestic roles of the house: cooking, cleaning, and watching the baby. In his free time he watches soap operas and reads romance novels. Meanwhile, his wife Bo-Ra (Jeon Do-Yeon) works at an English language institute and is having an affair with a former lover. Fred Cordiano Dec 15 2018 2:43 pm I enjoyed the movie. To view Miss Jeon in this character. Her husband lacked any feeling or strength until the final five minutes. Well Made... Maybe they should of communicated? Maybe she should of divorced him? Maybe she wanted to be a single lover with her ex beau? This is mostly a well made film. Although, it certainly is a dreary film on a common but odious topic. The cinematography and the acting were really good. But ultimately, I was left feeling very dissatisfied. I had zero empathy for the wife. Now, I'm in no way advocating what the husband did. Nor am I saying that they "got what she deserved." But she was a pretty despicable human being on ever level. So I was not in the least bit surprised. It is one thing for a husband to silently endure the ultimate betrayal of his wife. It is another thing altogether when the wife is leaving their infant alone, drugged, so she can go get drunk with her lover. So, as I said, I was not surprised by the ending. But I was surprised by key scenes totally omitted. That left huge leaps in the plot. For instance, after she drugs her child to go get drunk with her lover, the father coming home to find the infant all alone and unresponsive and in need of medical care, taking child to hospital, coming home to catch the lovers together...then....nothing. That's it. He just backs away from the door. Nothing more on that...Next they are riding in the car as she chatters inanely about insurance. What did she do when she saw that her child was gone? What did she say when she saw the husband with his child in his arms coming home right after her? If not then, what about the next morning? Anything? Nothing? Huh?....Cutting all that part out, only to leap ahead to the the final slow conclusion was a big mistake I think. It was such an unrealistic disconnect that ends up making her just a cardboard cutout and not a real human being. I require a certain amount of "Suspension of Disbelief" to enjoy a film. That big leap through the storyline and my Suspension of Disbelief was instantly cast aside by this directorial/script choice. Nor was it the only choice made by the filmmakers that bothered me. Just the most glaring. So, in the end I really cannot recommend this film. Rainbow Fish Feb 19 2015 9:35 pm This is a fantastically well plotted film with great acting from Choi Min Sik, Jeon Do-Yeon and Joo Jin Mo. It's a must see. It's brutal but logical and also comments on society. Joo Jin Mo won a supporting actor award at the Grand Bell awards-the Korean equivalent of the Oscars for this role.